It is with great pleasure that Kristen Lorello announces Giacinto Occhionero's second solo exhibition with the gallery, entitled "Reversibility Arch." 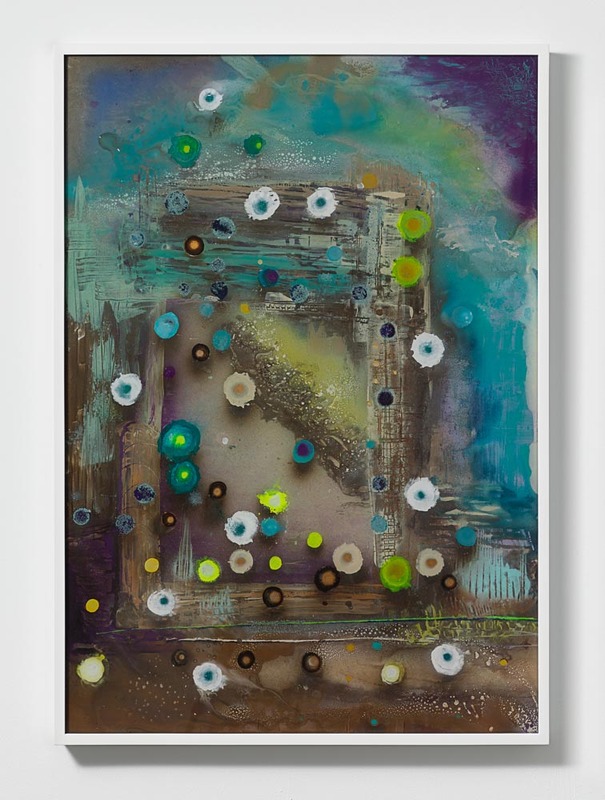 The exhibition includes seven new paintings made onto the reverse side of transparent plexiglass and viewed from the front. A small booklet containing images of the paintings and brief statements by the artist and the gallery is available. “Reversibility Arch,” marks an exciting new direction for Occhionero, towards a cosmic and enigmatic territory in painting. Over the past three years, Occhionero has explored the dot motif as a pointillist component of floral compositions and abstract patterns. He has also used it as a template through which to explore the different visual effects he can create by layering bursts of spray paint onto transparent surfaces. In this new series, Occhionero’s dots appear in alternately metallic, acidic, and juicy colors. 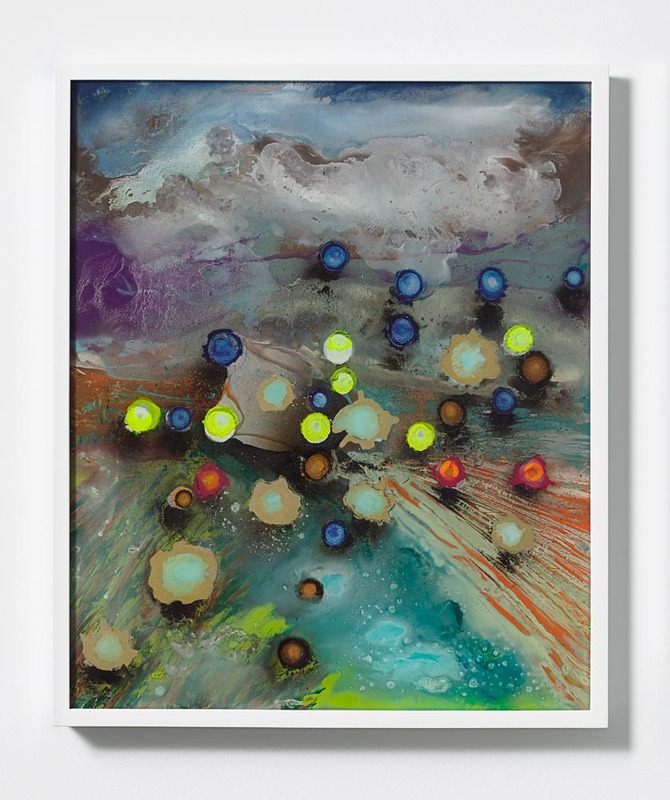 Suspended between the glossy surface of the painting and a view of land and sky in the background, the small circles of color cascade and swirl towards the viewer with a sense of luminous energy. For over a decade, Occhionero has maintained a studio in the industrial outskirts of Rome, where he has explored a process of painting on transparent synthetic surfaces. 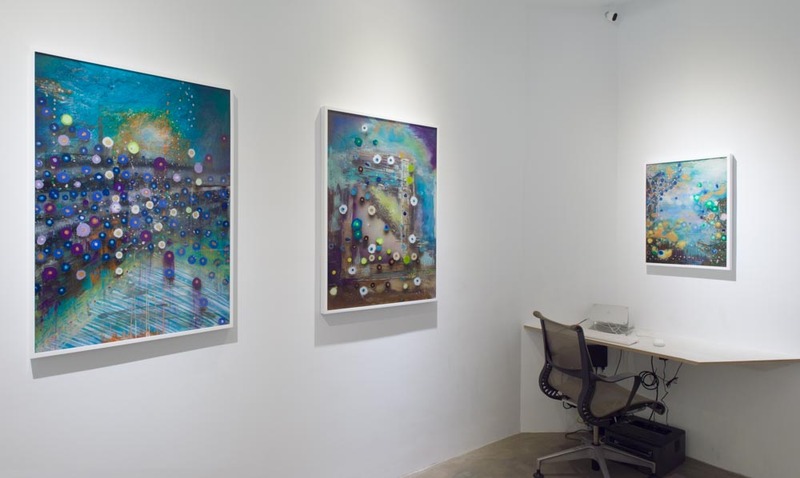 For "Reversibility Arch," he has expanded his research by painting each work in two separate layers, an initial layer of small colorful circles, sometimes outlined in a contrasting color, and a second layer that conveys the sense of a misty landscape or an animated ocean floor. As the artist describes, "tears, stripes, discolorations and corrosions appear, as well as dazzling reflections, underwater movement, the precipitation of stormy skies, and moving land--chiseled and scratched." He paints each work freely and imaginatively, with the hope of conveying a sense of fragility, spontaneity, and simultaneity. Giacinto Occhionero was born in Campobasso, Italy, in 1975 and lives and works in Rome, Italy. Solo exhibitions include Kristen Lorello, NY (2014), Z20 Gallery/Sara Zanin, Rome, Italy (2012), Teverina Fine Art, Cortona, Italy (2010), and Studio Pino Casagrande, Rome, Italy (2009). His works have been included in group exhibitions at 68 Projects, Berlin, Germany, Temple University Art Gallery, Rome, Italy, Greenberg Van Doren Gallery, New York, NY, and the Museo Pietro Canonica, Rome, Italy. In 2016, he was an Artist in Residence at the BoCs Artist Residency in Cosenza, Italy, and in 2013 was an Artist in Residence at the Maumau Artist Residency in Istanbul, Turkey. His works are included in the collections of the Capital Group, Los Angeles, CA, and the Banca Profilo, Milan, Italy, among other collections. He received his formal training at the Accademia di belle arti, Rome, Italy, in 1999.